I sit down with Michael Ambyth, Rudy Basso, and Alex Basso to discuss the new D&D deck building game, Tyrants of the Underdark and speculate on upcoming settings and storylines for the tabletop RPG. This podcast was recorded on June 19, 2016. I love strange fantasy races. The more bizarre the better. 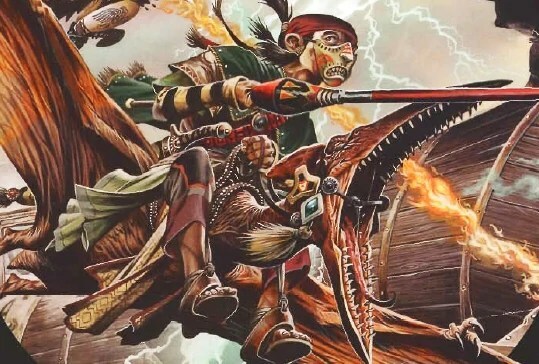 The grognards may shake their heads at shardmind, kalashtar, and dragonborn, but I say bring them on and keep them coming! 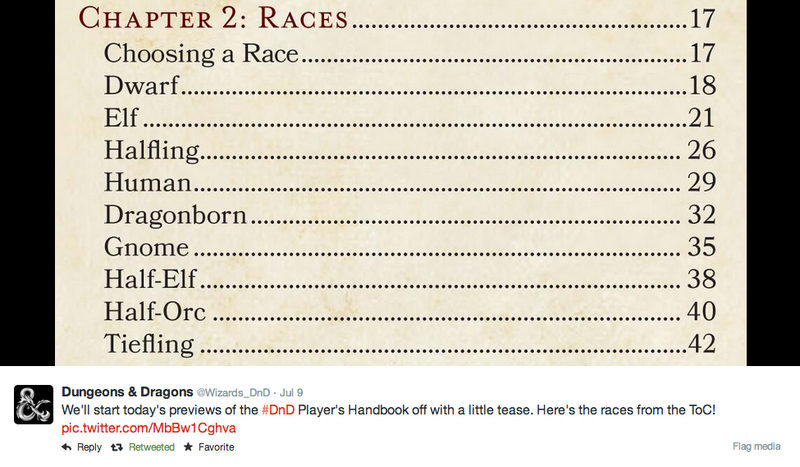 So needless to say I was a little disappointed, though not wholly unsurprised when I saw this list of Player’s Handbook races tweeted out by Wizards of the Coast last week. I need some more weird! I’ve written about my good habit of stealing ideas from those smarter than I. My favorite fantasy races are not the elf and dwarf (though I do enjoy a playing pointy eared or bearded PC from time to time). My favorites are the warforged, mul, genasi, and other races of setting specific campaigns. So I say, why not steal them for my own game if I love them so much? Yeah! Why not? Well, many of these races are specific D&D licensed property, meaning they are the original intellectual property of the company, meaning they were made by D&D for D&D (unlike elves, dwarves, orcs, and more which existed before D&D came along). That means they most-likely won’t be covered in the forthcoming OGL. That means I probably shouldn’t put them in products I’m planning on selling, like the Exploration Age Campaign Guide. Here’s my way of incorporating some of the more unusual PC races into the story of Exploration Age. I’ve already written about the shifters and warforged, but here are some others. Their behavior and ecology may differ from their original settings in order to bring them into Canus, but I tried to keep the heart and soul of the races intact. I want a thri-kreen to still feel like a thri-kreen. At some point, I’ll be creating mechanics for these races, but this post is all about making the races of other settings work in your story. This is just a taste. Like their githzerai parents, kalashtar are calm and contemplative, and like their human parents, inquisitive and curious. Such a combination marks these rare humanoids as ripe for a life of adventure. Kalashtar serve a vital role in the tribes. Often they act as emissaries, carrying a chief’s message across the neighboring lands, or as neutral mediators, negotiating peace between two warring tribes. Kalashtar often break off on their own when they come of age, hoping to see all that Canus has to offer. More than any other race, they are willing to travel to West Canus. The furtive stares and pointed questions of the locals do not bother them, since the Kalashtar are just as eager to stare and question them back. Kalashtar adventurers could be druids wandering the wider world cataloging all manner of flora and fauna, mages studying the origin of magic, paladins who believe all life is beautiful and worthy of protection, or anything you dream. If half-elves are rare in Exploration Age, then muls are practically unknown. These half-human, half-dwarves are met with pity, fear, and disrespect across West Canus. Mul struggle and often fail to find belonging among either their human or dwarven kin. Like half-elves, this not-so-subtle poly-ethnic persecution is at the heart of their racial identity. In Bragonay, muls are not brought into the caste system. They are treated as outsiders and have no access to the services of the region. Unlike Kalashtar, these half-dwarves, do feel the burn of the many eyes that glare at them with suspicion. As a result, they speak little and do all they can to blend into the crowd. However, muls are not pushovers. They end conflict swiftly, usually with a harsh word or solid hit to the mouth. The life of a mul is usually one of lonely wandering. They are occasionally accepted by bands of half-elves and could live a more stable life in Marrial or somewhere in Verda. For the most part muls serve as self-taught mercenaries and thieves, making their living off their strength and resilience. Mul adventurers could be wandering thieves, battle-hardened professional fighters, demolitions experts, or anything you dream. If you like weird, you’ll love the shardmind. Amongst the rare races of Canus, sharmind are the most uncommon. These crystalline beings were created long ago by the chromatic dragons of West Canus. No more have been made since the shardminds rose up against their creators. Despite their infinite life-spans, many met their ends in that uprising, and throughout the millennia others have fallen admist adventures and battle. This dying breed is made up of wandering hermits, secluded scholars, and nihilistic daredevils. The shardminds alive today have forgotten more years than most other humanoid races have lived. Some shardmind let their long lives fuel them, diving into research and training to hone their abilities and become the best they can be at a particular discipline. Others have given up and now seek a glorious death in an adventure. They want to go out of this meaningless life in an explosive finale, often battling against their most hated foe – chromatic dragons. Contemplative, quiet, and patient are the virtues of these crystalline people. Shardminds are often loners, and many members of other races go their entire lives without ever seeing one. Unless they are adventuring with a party, they tend to avoid populated areas and make their homes in the wilderness so they might be alone with their thoughts and projects. Sharmind adventurers could be scholarly mages unlocking the secrets of the universe, fighters seeking their glorious end, hermit clerics who have tapped into the power of the divine, or anything you dream. Deep gnomes, or svirfneblin, live with the drow and duergar of Quatus. They share the same brotherhood and loyalty of these peoples but they have something the too-practical duergar and devil-may-care drow lack – a sense of hope. While duergar have accepted their war with the aberrants as eternal and the dark elves bury the issue with partying, the deep gnomes believe that someday they could beat the aberrants. The svirfneblin have not lost sight of what makes life worth living. Deep gnomes work hard; they are tinkerers and inventors who love working the stone and metals of The Underdark. They take great comfort in spending time with family and friends, drinking good tea, and eating good food. They understand the complex and take joy in the simple. The gray dwarves would say the svirfneblin are naive, while the drow would say they are too boring, but there is a reason all three of these races live together. In the darkest hours of Quatus, the hope that the svirfneblin provide is infectious to the other races of the war-torn country. Amongst the people of the surface, svirfneblin are met with kindness. They are honest merchants and well-mannered diplomats, but they do not often serve in these rolls since they can be easily pushed around since they are too willing to trust. A deep gnome merchant is usually a good thing for a consumer looking to make a dishonest deal. Svirfneblin adventurers could be crafty rogues, curious tinkerers, mages out to end the aberrant threat for good, or anything you dream. Thri-kreen tribes have been stalking The Sprawling Jungle of Verda for as long as humans have been on Canus. These bellicose humanoids answer almost any threat or annoyance with battle. Thri-kreen are bitter toward enemies, suspicious of outsiders, and take extreme all-or-nothing solutions to most problems. However they are also loyal allies and friends. Thri-kreen enjoy battle and take pleasure in the thrill of placing one’s life on the line. 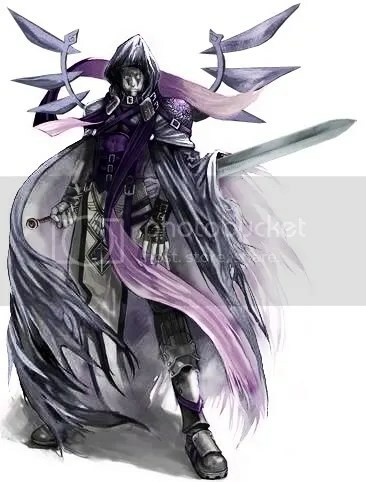 To them, the best and most honorable death is one that comes from an enemy blade. The strongest warriors are always the chiefs of their tribes. Thri-kreen are taught the ways of battle from the time they are little. Even when a thri-kreen tribe isn’t at war, it trains with other tribes and within its own people. Thri-kreen warriors and mages fight one another for entertainment, an activity which guests of the tribe are expected to join. Other than battle and the study of war, thri-kreen take pleasure in nature. They find it peaceful to commune with plants and animals after a long battle and are taught the names and behaviors of all the all that lives within the jungle. Thri-kreen treat most other races suspiciously, particularly folk foreign to Verda. Their trust is hard to earn and usually won through battle. Once that relationship is earned, thri-kreen will die for their friends. 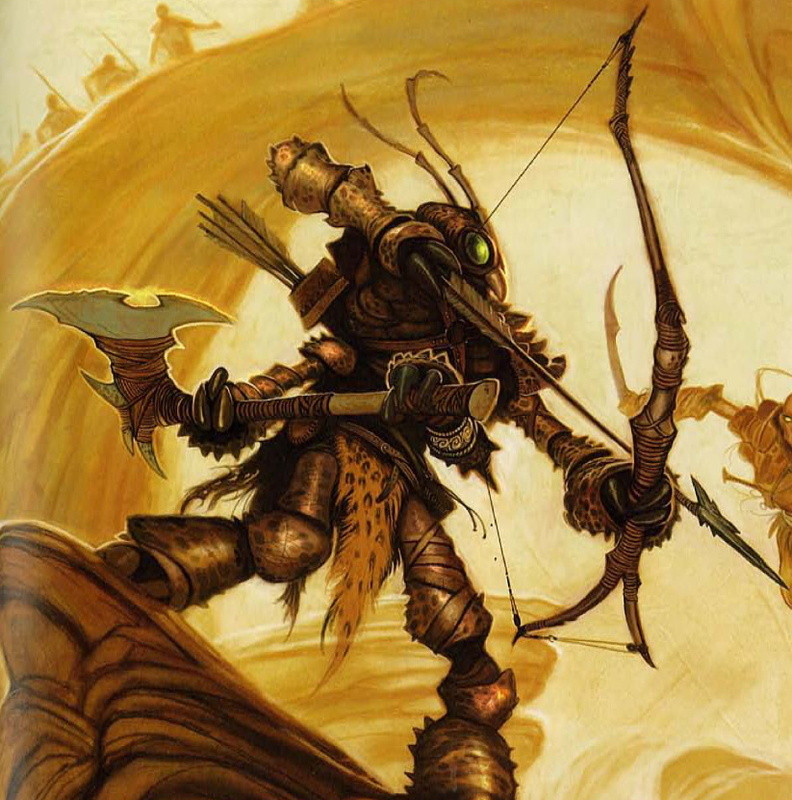 Thri-kreen adventurers could be honorable barbarians, wise druid shamans, fierce rangers defending the jungle, or anything you dream. First up, my real world timeline. I wanted to give you all a quick update on the Exploration Age Campaign Guide. Most of the history, description, and fluff has been written. That’s all being looked over by a group of close friends, pretty much all of the guys who play in my campaign. I’m taking the comments left on the blog into account as I revise and edit as well, so please keep them coming! Right now all mechanics are still being tweaked. Obviously, I’m waiting for the release of the fifth edition Dungeons and Dragons core rule books before I lock it all down. I won’t be able to release anything for sale until the Open Gaming License is revealed in 2015. That’s good, because it gives me more time. I’m only one person and I can only do so much, especially when I want any modules and supplemental rules to be fair and balanced. All that being said I know I can start finalizing some of the mechanics I’m creating starting July 3rd when the first set of D&D Basic rules drop and my local friendly gaming store will put out the D&D Starter Set. Wow that is close!!! I also know that a lot of folks out there are eager to start a campaign around August 19th when the Player’s Handbook drops. Maybe, if I’ve done my job right, there are a few of you eager to play in the world of Exploration Age? Maybe with a less complete campaign guide lacking art and layout, but for free? A manuscript version of the Exploration Age Campaign Guide, if you will. If you are interested in that sort of thing, keep checking back here and follow me on Twitter for updates. It’s going to happen, but I won’t be giving it away for free for long so keep your eyes and Twitter feeds open. When I first began getting into the details of Exploration Age, I wasn’t sure where to begin. If you’ve been following this blog for a while you how I determined the ideas and themes of the world as well as the major events inspiring Exploration Age. But what led to all of these events and got Canus into its current state? I needed some help and inspiration. I looked at the timelines of my favorite campaign worlds like Dark Sun , Forgotten Realms, and Eberron. In looking at these timelines I realized something huge. Timelines are outlines. They give readers and authors the significant events in a world’s history. These events are deemed significant by the fact that their impact is still being felt in some way in the present. I didn’t just need to write a history, I needed to start with a timeline to help me mold the rest of the world. All of these timelines begin with big, broad strokes which paint the settings’ most important beginning events with hundreds, thousands, tens of thousands, or hundreds of thousands of years in-between events. Heck, Eberron’s first event in its Age of Demons is 9.5 million years away from the next. ??? Aberrant beings rule Canus. The first dragons hatch from eggs buried deep within Canus’ core and the tunnels they dig to climb out become The Underdark. The Chromatic Dragons bleed from the effort, lacking the hard scales of their metallic brethren, and their blood turns into the drow. Somewhere in the present day Damned Lands, a psionic race of peaceful humanoids has shielded their lands from the aberrant influence. 500,000 BF In present day Findalay and Parian, Chromatic Dragons, coveting power for themselves, war with the huge population of aberrants, but become locked in a bloody struggle in which no side ever has the clear advantage. Metallic Dragons in Verda form a less straight-forward plan to beat the abberrants and begin experimenting with planar magic. 300,000 BF Chromatic Dragons create the shardminds who, enslaved by the dragons, destroy the aberrants in Findalay and Parian. The remaining abberants flee underground. The Damned Lands earn their name as an unknown tragedy envelopes the land. For hundreds of millennia its skies and lands glow hot with psionic energy, changing the land and destroying all civilization within its borders. Metallic Dragons open a portal to The Nine Hells, releasing legions of devils upon Verda to battle the aberrants. While many devils are subservient to the dragons who summoned them, others are able to break free of their bond and form alliances with the aberrants. The devils and the aberrants mate, creating the morchia. 100,000 BF The shardminds rise against the Chromatic Dragons in a surprise attack, releasing two races of their own creation – the dwarves and the gnomes. Canus is completely devastated by the attack. The shardminds are spread far and wide as are the dragons, with most of their civilization in ruins, few of either ancient race remain after the war. Some gnomes and dwarves are driven deep underground and welcomed by the drow, while others begin to build new lives on the surface once the war settles down. The Metallic Dragons of Verda create a race to uphold their ideals of learning from the devils still loyal to them known as the tieflings. Eventually people show up in the world and that’s when the timeline becomes less broad. As people, our personal history is more important to us and has more of an impact on our present. Still, the far past of human history is painted in broader strokes with more time between events than the more recent past. The rise of Christianity, the fall of the Roman Empire, and the Norman Invasion are events in our own distant events which shaped our world today. The period of time between events could be hundreds of years, decades, or less. These medium-broad stroked events are also part of the history of fictional campaign worlds. 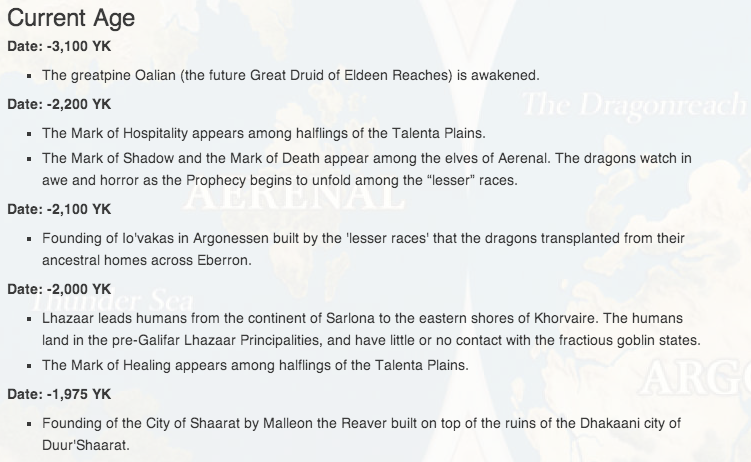 Again, I’ll use the Eberron example. These are still pretty big jumps, but smaller than above. Exploration Age has some similar jumps in its timeline as it comes closer to the present year – 403 FF. 4,000 BF A sect of devout humans on Parian, now an established, powerful nation, face religious persecution from their emperor. The remaining gnomes face racial persecution. Together they board a boat in search of safer lands and come to present day Aeranore. The dwarves welcome the humans and gnomes, who, in exchange for land of their own, promise to aid the Bragonians in a renewed fight against Taliana and Marrial. Tieflings, fearing their own destruction at the hands of the morchia, begin to research a way to seal the morchia in The Underdark. 3,500 BF Parian declares war on Aeranore, seeking to punish those who left. Bragonay turns to the powerful Parian, offering to help destroy the inhabitants of Aeranore in exchange for help against Marrial and Taliana. Aeranore joins forces with Marrial and Taliana against Bragonay in return for aid against Parian. The First Great War begins. On Verda, the tieflings use The Reckoning Spell to bind the morchia back beneath the ground. The ritual is so powerful, they break it into many pieces and hide it. 1,000 BF Parian declares a truce with Aeranore, Marrial, and Taliana in exchange for trade rights. Bragonay now faces a war against the other three Findalayan nations alone, but is aided when Taliana’s capital city is swallowed by a massive earthquake. 500 BF Desperate, Bragonay makes an exclusive treaty and trade agreement with Marrial to remove them from the war. Taliana’s capital is rebuilt on the site of the old. It is usually during this time that many histories have their defining moment of the current age. In the real world for many cultures this defining moment was the rise of Christianity. BC standing for Before Christ and AD standing for the Latin phrase Anno Domini meaning “in the year of the Lord,” are good examples of that. All other events in many of Earth’s cultures are defined by their temporal relation to the birth of Christ. Regardless of your beliefs, that’s some lasting influence right there! In Exploration Age the defining moment for the calendar is the founding of the continent and nation of Findalay. For tens of thousands of years the various nations of Findalay were at war with one another. When the leaders signed a (temporary) peace and officially created their borders, that moment was huge for the people of Exploration Age. It has helped define the current age in a major way. Thus everything in the Exploration Age timeline is either BF (Before Findalay) or FF (after Findalay’s Founding). When one thinks of the recent past, he or she can name numerous defining moments of the world’s history. In the United States we still feel the effects of slavery, World War II, the moon landing, the terrorist attacks of September 11, 2001, and more. I could name a bunch of events in the past few years we’re still feeling. That’s how it goes when you’re looking at the recent past. Even smaller events have an impact if they’ve happened recently. 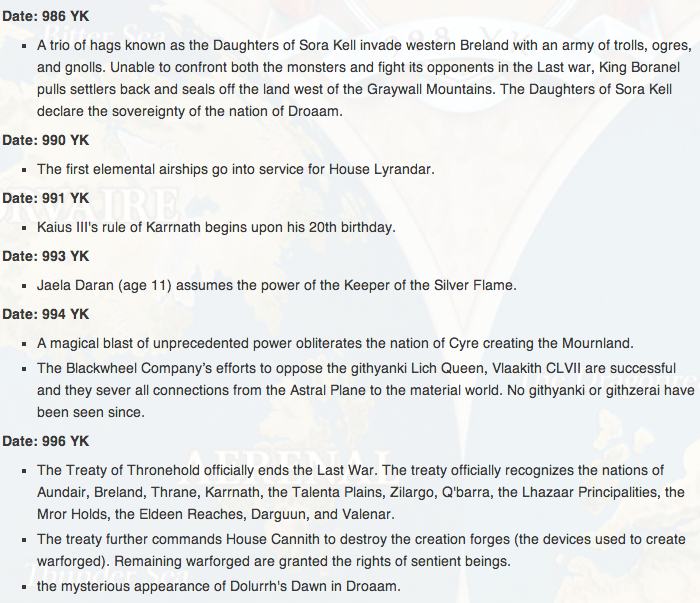 Again, let’s look at Eberron, who’s starting campaign year is 998 YK. Not only is the distance between events much shorter, some years have multiple significant events. Less than 10 years between jumps here. So for Exploration Age the trend follows. When I got to this point in the time I began with broad strokes. There were major events I knew I wanted to have happen – like the cooling of The Damned Lands, the creation of the Explorers’ Guild and The Society of Seekers, and of course, the discovery of Verda. Then I put random placeholder entries between the years of major events I knew I wanted. In those placeholders, I began placing minor events. These were usually events that I wanted to happen that would create interesting organizations, adversaries, conflicts, and adventure sites for PCs in Exploration Age. Some of these events were ideas I had in my head for years and some were things I thought of on the spot as I was filling in the spaces I had created for myself. As I’ve used the timeline as an outline to flesh out the actual Exploration Age Campaign Guide, events have been added, subtracted, and modified. I love coming up with another cool idea and then finding a place within Exploration Age’s history for it. Take a look at some of Canus’ recent history. 377 FF The Plague of Twenty Cycles comes to Verda and decimates the tribal population for twenty years. 384 FF Parian discovers Marrial’s involvement in the freeing of slaves and joins Bragonay in battle due to Marrial’s breaking of the Pardalay Treaty. 387 FF Desperate to remove the pressing grip of Parian and Bragonay, Aeranore makes a deal with Parian and provides them with slaves to replace those lost to Marrial. Parian agrees to the terms and leaves the Fourth Great War. 392 FF End of the Fourth Great War as the warforged rise up against the dwarves. 393 FF The Explorers’ Guild discovers Verda. Findalayan countries and Parian rush to establish colonies. 397 FF The Damned Lands finally cool and exploration begins… and most end badly. 401 FF Ragorn Zhul Prison has a massive riot and the guards stay on the walls. The prisoners stay inside and run the prison city. So that’s the Exploration Age timeline! Take a look and let me know in the comments below if you’re toying with the idea of playing a few sessions in Canus. All right, it’s time to talk about a piece of real estate on Findalay that is near and dear to my heart – The Damned Lands. That brilliant little piece of world that is unexplored on the map. We can tell from its name, The Damned Lands, that things are… well, pretty bad. But what exactly is going on over there? So there’s a few problems with writing about The Damned Lands, namely they’re supposed to be unexplored and mysterious so I want to leave a majority of their description to the imagination. Why do this? Well for one thing, Exploration Age needs some areas to be explored. I like the idea of having Verda be the habitable, resource rich area that has new life. It’s wondrous and beautiful as well as dangerous and exciting. The Damned Lands are a different kind of exploration – grueling, horrific, and alien. The rewards here need to be potentially even greater than in Verda to get adventurers to consider entering The Damned Lands. Mystery is a big part of the atmosphere and legend of The Damned Lands. It will help keep the frightful anticipation levels up while traveling there and keep players on their toes while adventuring in its depths. However, enticement is also a big part of mystery. You need to have some information in order to make an area feel intriguing. For instance, many of us have played the popular childhood game Bloody Mary just to see what would happen. We played this game even though the best case scenario was nothing happened and the worst case scenario was an evil, psychopathic ghost of Queen Mary appeared and devoured your soul. Someone really should have done a cost benefit analysis there, but because rumor had it other kids had successfully invoked Mary, you went and tried it just to see what would happen. The danger of The Damned Lands will be enough to entice some. When it comes to experimentation and risk-taking, I find many players are more cautious with the lives of their characters than they were with their own real lives when they were kids. This actually makes sense. Most PCs are adults and as adults, most of us don’t play Bloody Mary because we’re aware that at best and definitely-most-likely, it will yield no result and waste our precious time while at worst and probably not-going-to-happen we lose our soul. So we need to give just a little more information about The Damned Lands and that is – there’s some pretty cool treasures down there… and some people who spend a lot of time in The Damned Lands develop special powers. So there’s another issue with The Damned Lands. The idea of crazy, dangerous wastelands is not breaking new ground in D&D campaign settings. Eberron has The Mournland and Forgotten Realms has the Dread Ring. Heck, all of Dark Sun’s Athas is a horrific wasteland. I’m trying to be somewhat original here, but I must admit that the idea for The Damned Lands is stolen from these places. So what makes this place different? Well, a few things as you’ll see in the description below, however I’ll point out a big one here. The Damned Lands have always been a mystery and yet the people of Findalay have always known they were there. Constantly drawing curious and fearful eyes, these lands have never had another name. They were always The Damned Lands and have forever been a mystery. Another thing that makes The Damned Lands different is the crushing madness that can grip anyone who stays within its borders for too long. Known simply as The Madness, there is a real, palpable, nigh incurable insanity that can grip all but the strongest minds who choose to venture there. The Madness usually takes hold before any sign of developing a special power occurs, so often these powers come to an individual at the price of their sanity. Thus The Damned Lands have a few residents who once desired powers and are now broken and full of dangerous psionic energy waiting to be unleashed. More than half a million years before the start of the campaign, it is believe that within The Damned Lands there existed a peaceful race of advanced psionic beings. This mysterious race of people was able to erect a psionic shield around their entire nation which kept out the aberrants. The aberrants and dragons were so busy with their own war, that they paid the isolationist race very little attention as they tried to kill one another. Then in roughly 300,000 BF the psionic shield was dropped and the entire country glowed hot with energy for hundreds of thousands of years. Even at night The Damned Lands could be seen glowing in the distance beyond The Deep Orc Mountains. Any who tried to make their way beyond The Damned Lands’ borders quickly became violently ill and died, their bodies cooked in harsh burns from the strangely irradiated landscape. The Damned Lands earned their name and the people of Findalay learned to respect that and steer clear. Slowly, overtime, the glow of The Damned Lands began to soften and cool. Strange creatures, unlike any ever seen with weird psionic abilities began to appear in The Deep Orc Mountains. Then as the lands began to lose their glow altogether, animals and creatures resembling those from Canus’ modern day Material Plane began appearing with strange mutations and psionic powers. They were often crazed and violent. Once The Damned Lands cooled, Findalayans began to explore the region cautiously. That’s when they began to discover ancient ruins of this once great civilization and its many unique treasures. Powerful magic items, certainly, but also rare bioorganic items that meld with an individual’s mind and body to grant him or her unique powers. They seemed to do everything from help with mundane chores and hobbies (such as a wrist implant which can make ones hands resistant to heat while cooking or an ocular implant that allows one to better appreciate the details of sculpting) to rarer more powerful implants (granting abilities such as growing detachable, projectile spikes out of one’s arm or a prehensile tail to aid in climbing). Stranger still, when an extended period of time was spent in The Damned Lands, the folk of Canus seemed to unlock strange, psionic abilities within themselves. These abilities included mind-reading, telekinetic powers, flight, enhanced speed, enhanced strength, mind-control, regenerative properties, the list goes on and on. The more time spent in The Damned Lands, the more powerful these abilities seemed to become. However, the more time spent in The Damned Lands, the harder The Madness becomes to resist. And that’s the big problem with exploring The Damned Lands. The Madness grips an individual like a vice, squeezing slowly and constantly until he or she cannot get free of its grasp. Not to mention the strange monsters that roam The Damned Lands infected with The Madness and the freakish weather effects that are harsher than anything one might experience anywhere else in Canus. The treasures above are difficult to come by – even those most seasoned adventurer is far more likely to find death or insanity than wealth and power. And considering the time it takes to develop a special psionic ability within The Damned Lands borders, it’s nearly impossible to gain a power without first meeting one’s doom. Daunting. That’s what the beginning of this process is. Where does one start? History? Geography? Religion? Science? Culture? There’s so many ways to go it could drive a person insane and make him wonder why he’d ever want to do this in the first place. I want to create so many things, but I have no idea where to begin. But then I remembered, this world is not just for me. This world is for my players. Sure, I’m building the sandbox and turning some of the sand into cities or monsters or gods, but they’re the ones who jump into the sand and play with the stuff I create. So I figured, before beginning anything in-depth, I would ask them what they love and hate about the D&D campaigns they’ve played and what they want to explore in the future. That way, I wouldn’t spend too much time creating a rich world history full of political intrigue and scandal if they would rather play in a world full where anarchy reigns supreme. Well, I couldn’t rightly just put my players on the spot and ask them what kind of campaign world in which they wanted to play. Some of them may have never thought about it beyond, “One with my friends in it.” So I thought up some big, general questions that I could ask my players about the world I’m building. I decided the questions should be short in words. Bullet-pointing things makes it easier for folks to answer all your questions. My advice in getting anyone (D&D players or otherwise) to respond to your emails is to keep the questions short, clear, and bullet-pointed. Do that and you’ll have everything answered in a timely manner. In the case of the questionnaire below, I used Eberron, Dark Sun, and Forgotten Realms to define some of the questions. I picked those three because my players have quested in all of those worlds. You could use anything for an example though, and it can come from outside the world of tabletop RPGs. Video games, movies, books, comics, television, and any other medium that you share with your friends will work. I find people understand better what you’re saying when you ask, “Do you want to play in a world like Lord of the Rings?” as opposed to “Do you want to play in a game with a medium amount of magical technology?” Check out the questions I asked below. High magic (like Eberron)? Mid Magic (Forgotten Realms)? Low magic (Dark Sun)? Do you like your gods interventional (Forgotten Realms)? Non-interventional (Eberron)? Or Dead (Dark Sun)? Or maybe just on God (Christianity)? Do you want a world where most people are basically good? What about a world where evil rules (like Ravenloft)? What movies should it be like? What books should it be like? What genre is should this world be? If you were to give it a place and time period in history what would it be? What is the one thing you must see in the world? The one thing you’d hate to see? What interests you in a game? Then I threw out some ideas to get their creative juices flowing. I didn’t throw out every idea I had, just a few – some normal and some weird. This was a two-fold strategy, first to inspire creativity and second to let the players know no idea is lame or stupid. I wanted to hear anything and everything they had to say. Here’s what I threw out to them, letting them know these were hypotheticals that didn’t actually need a response from them since they were so specific. Though if they wanted to comment on any of them it would give me some excellent insights. Do you want war to ravage the land? A world stuck in perpetual night? 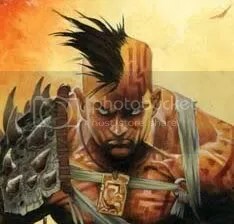 Are shardminds a playable race? Are they existent? Should there be dinosaur riders? Should there be volcanoes that spew blood? The last thing I did was NOT BCC everyone, but rather put them in the TO line of the email. This was also a two-fold in purpose. One, it could inspire some great “reply all” discussions and have my players building ideas off each other. Two, it would remind the players who were straggling to answer that they should do so, as they saw multiple emails of the same subject line fill up their inbox. Any player who didn’t want to reply all had the option of responding to me directly, of course, and I made that clear as well so anyone with any reservations about their ideas had the option of sharing privately. What followed the sending of the questionnaire email was another 61 emails amongst ten people. I was in world builder heaven. Many of the emails were short, just someone saying, “Oh I like that thing too and didn’t say it in my initial response,” so it wasn’t overwhelming to read. I also found that the players who initially responded only to me, after reading the reply all messages felt comfortable enough to bring their ideas to everyone. So the reply all thing really paid off. Here’s what I found out about my players.